When it comes to your wedding, little details make a big impact. From decorations to desserts and everything in between, even the smallest elements can make your wedding day unforgettable. Maybe you’ve spent a lifetime dreaming up every aspect of your wedding, or maybe you’re just now starting the planning process. Either way, your long-awaited celebration is approaching, and now is the time to create the memories that you’ll cherish from this day forward. If you’re like me—a cost-conscious bride on a budget—you may be tempted to oversimplify your wedding, thinking that embellishments and details will add up to financial fiascos. But you don’t have to spend a fortune to make your wedding look like a million bucks. 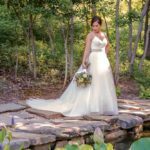 In fact, adding small, reasonably-priced details can generate the highest return on investment by creating a personal, memorable wedding that’s uniquely yours. 1. A good start. Never underestimate a goodie bag. Before your rehearsal, welcome your wedding party and family members with goodie bags including snacks, bottled water, fruit, a list of area attractions, important phone numbers and a handwritten note thanking them for being a part of your special day. 2. Schedule on point. Print an agenda of your wedding events—the time and location for every activity including the rehearsal, rehearsal dinner, hair and make-up appointments, the wedding ceremony, pictures, reception and clean up. Provide copies to everyone in your wedding party so they’ll feel involved and in-the-know. 3. Flowers in her hair. Consider wearing a hand-crafted flower crown of seasonal blooms. Delight bridesmaids and flower girls with matching flower crowns, or invite them to create their own with fresh blossoms provided by a local florist like Petal Flower Company. 4. A warm welcome. If you’re planning an evening ceremony outdoors, provide guests with throw blankets or oversized scarves so that when the sun sets, they’ll have more than your vows to keep them warm. Signage tells your guests exactly where to park, where to find the ceremony, where to sit, and what hashtag to use. This little detail will make your guests feel welcome and eliminate confusion. Find upcycled antique mirrors and stylish chalkboard signs from local vendors like Vintage and Scripted. 6. A cultural experience. Whether it’s jumping the broom or breaking a glass, adding cultural traditions will make your wedding stand out. For example, in the Chinese tradition, the wedding ceremony begins on the half hour to cement the couple’s good fortune. Under French custom, the groom walks his mother down the aisle before arriving at the altar. Find out ways that your ancestors celebrated and incorporate customs from your family and your sweetie’s family. 7. Party of 2…or more. If you or your sweetheart have children, involve them in your ceremony. Invite them to join you during the unity symbol. Present them with a token like an engraved necklace when you exchange rings. You’re not just becoming husband and wife—you’re becoming a family, and your children will remember this special day forever. 9. Centerpieces with a twist. Put your own twist on traditional centerpieces by trading blossomed flowers for branches embellished with ornaments, fairy lights or beading. Add a personal touch around the base, like your favorite books or framed photos of your adventures together. 10. Garnished cocktails. Greet guests with glasses of bubbly garnished with seasonal flavors like raspberries, mint, pomegranates or orange rinds. 11. DIY photo booth. Find a simple backdrop and place a basket of props nearby. Feather boas, hats, silly glasses, and dress-up jewelry can be purchased at your local dollar store or online. Ask your photographer about on-site prints, or invite guests to snap their own pics. 12. The kids’ table is back. Remember sitting at the kids’ table for large family gatherings? Having a table just for kids (if they are invited) gives them a dedicated place to hang out, and gives their parents a chance to enjoy conversation with other adults. Add crayons, coloring books, stickers and crafts for instant entertainment. 13. Anniversary dance. Ask the DJ to invite all married couples to the dance floor to share a slow dance together. After a few moments, the DJ announces, “If you’ve been married for less than 1 year, please return to your seats.” As the song continues, the DJ asks couples to sit who have been married less than 5, 10, 20, 30, 40, and 50 years. At the end of the song, the remaining couple has been married the longest, and all of the guests give them a round of applause. 14. The dessert bar. Let them eat cake. Or pie. Or fudge brownies. Or all of the above. Serve an array of mini desserts instead of one colossal cake to cater to all guests’ palates. 15. The send off. Bubbles, sparklers or confetti make for the picture-perfect send off. Ask your bridal party to distribute these items to guests before the send off for a seamless transition from reception to happily ever after. Ultimately, the best way to make your wedding stand out is to enjoy the day together. The best weddings are relaxed and stress free. Show your guests how much you and your sweetheart love each other. Take plenty of time to embrace your soulmate. Your love is the reason for the celebration, and your wedding is just the beginning of your beautiful, lifelong story.